Throughout the #12DaysOfGiving we had bins in our office to collect winter clothing and canned food for Community Care. What began in 1919 as food and clothing assistance has grown to 17 programs - with their vision for a healthy, caring community where everyone lives with dignity and purpose, they are making a huge impact in our community! This year we wanted to add a new way of giving. We thought acts of kindness would be a great way to give people a surprise Christmas present. We packaged up thermal socks, gloves, hats, and a $10 Tim Horton's gift card in a little bag to be handed out to the homeless. These packs would offer them warmth in the winter and a hot meal. We drove around downtown to try and find people that we could offer these gifts to. We will continue to hand out the packs till we run out. We also had $2 Tim Horton's gift cards to offer to people we ran into on the street - it's always a nice surprise to be offered a free Timmy's coffee! Michael making up our warmth packs to hand out. Michael, Paco & Danielle bringing coffee and timbits to site. Yesterday was our annual site visits! 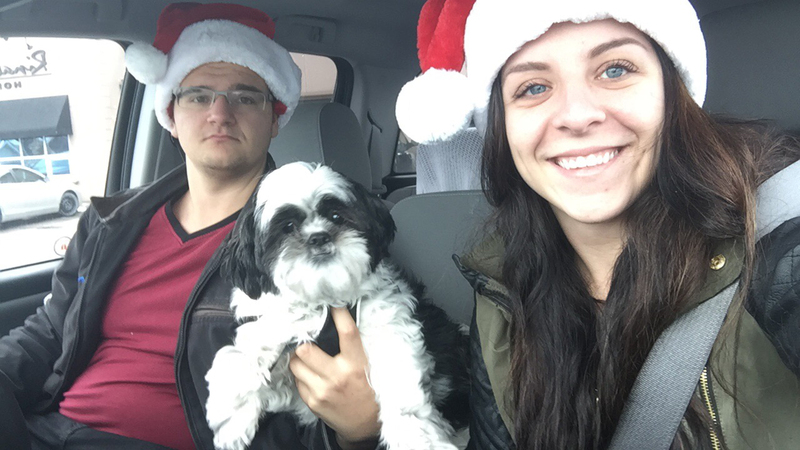 This year we took Paco along for the ride - we brought Tim Hortons coffee and Timbits out to Merritt Meadows, Rosewood Estates and Optimist Village. It wasn't as cold yesterday as it has been but it was still a nice treat for everyone to warm up with some fresh coffee. As someone with a nice and warm office job, I'm not sure how all of our guys and the trades do it. I was out there for just a few short hours and my toes were frozen! They say you get used to it, but I'm not sure I would. It's not easy being out there everyday, but we really appreciate our guys and our trades! They help us to maintain our high quality and build your dream homes on time. Thanks guys for all that you do, we are very grateful. Breakfast is the most important meal of the day, especially for kids who are growing and learning all day long! Robyn let us know about Canadian Martyrs Elementary School, who runs a Breakfast Club on Monday, Wednesday, and Friday for their students who may not have access to a healthy breakfast every morning. Norma and Pam have taken on the task of feeding the children before classes begin. It's a very short window they have between buses arriving and the bell ringing, but they manage to do it in a very smooth manner. On Wednesday we brought an extra special breakfast in for the students! With the help of Sunset Grill (Fourth Ave), we were able to serve up a big hearty breakfast of pancakes, bacon and fruit. You could smell it down the hall and throughout the whole school by the end of serving - smelt amazing! The kids' faces were priceless when they walked in - I think the best word to describe it is "shock". They were stunned when they walked into the room and saw a big heaping pancake on their plates. Some were so excited just to have bacon, which they don't normally get at home. They were all so polite and grateful - one student said to Joan, "Wow, thank you so much for this. This is the best breakfast ever!" We were in and out with the children in about 15 min - but those 15 min meant a lot and we were so happy to help out with such a great program. Thanks to Pam and Norma for putting in the effort every day to serve the children a healthy breakfast to start their day off right! The YWCA Niagara Region provides emergency homeless shelter, food, and assistance to women in poverty. They are committed to social change and work to create a community that supports women who are living in poverty and provides support through each step towards financial stability and independent living. The YWCA is a leader in the Niagara Region providing awareness through education and advocacy to raise the equality of women and the visibility of issues in our community. They are also one of the local organizations that is feeling a real stretch of resources with the increase of demand for homeless shelters and meal programs this season. In the Niagara This Week article, Elisabeth Zimmermann, Executive Director of the YWCA, had said that they are seeing cots being set up in program rooms to accommodate the overflow. I have had the opportunity to meet and work with many of the staff at the YWCA and WOW - they are all so genuine and have such big hearts! They really care about the work that they do and you can see that in the events that they run. This year we were sponsors for their No Fixed Address event, and we even slept in our cars overnight to gain a new appreciation for all that we have. We also took part in their Women in Leadership event that brings new light to many topics surrounding women in leadership and raising each other up. YWCA, thank you for all that you do in the community! A member of our team, Brian, brought up donating to the Welland & District Humane Society this year and we thought that was a great idea. He supports the centre and has adopted his family dogs from there in the past - as animal lovers, we were totally onboard! Paco wanted to make his contribution to the #12DaysOfGiving this year too! The Welland & District Humane Society is an affiliate of the Ontario Humane Society and that affiliation gives them authority to investigate cases of animal cruelty and prosecute offenders when necessary. Over the last few years Welland & District SPCA has grown to include its own spay/neuter clinic and a mobile S/N clinic. A close partnership with Petsmart Charities of Canada has helped their clinics and their S/N initiatives. They continue to set the PACE for animal Protection, Advocacy, Care, Education - and they are striving for a future where no animal is left alone, unwanted or mistreated. If you have ever visited the SPCA you know how hard it is to see all of the animals there without homes (and not take them all home with you). This year we brought them lots of treats, leashes, toys and food. Paco helped to bring all of our donations to the centre and visit all of his buddies! 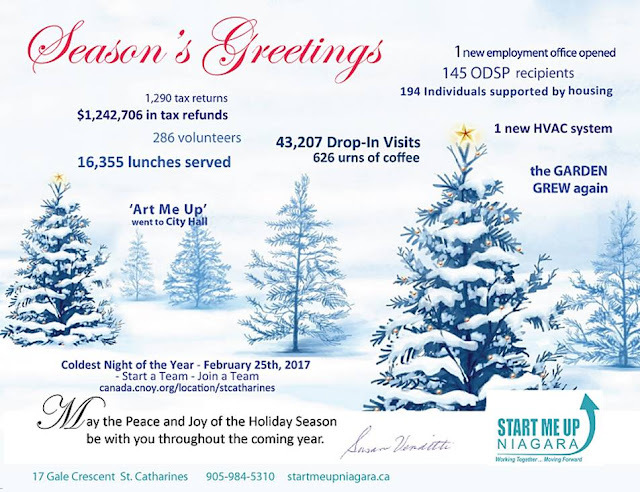 Start Me Up Niagara operates a vibrant Outreach Centre located in downtown St.Catharines serving those in Niagara who are experiencing significant life challenges such as poverty, homelessness, unemployment, addictions and mental illness. They provide opportunities to improve health, increase community integration and support employment. On Sunday we brought lunch to SMUN, as they provide lunch every weekend to those in need! They envision a society where all people are included, healthy and self-sufficient. Looking to get involved and give back in the community? SMUN's Coldest Night of the Year is coming up in the new year, February 25th, 2017 - look at the impact their event has had on the community! 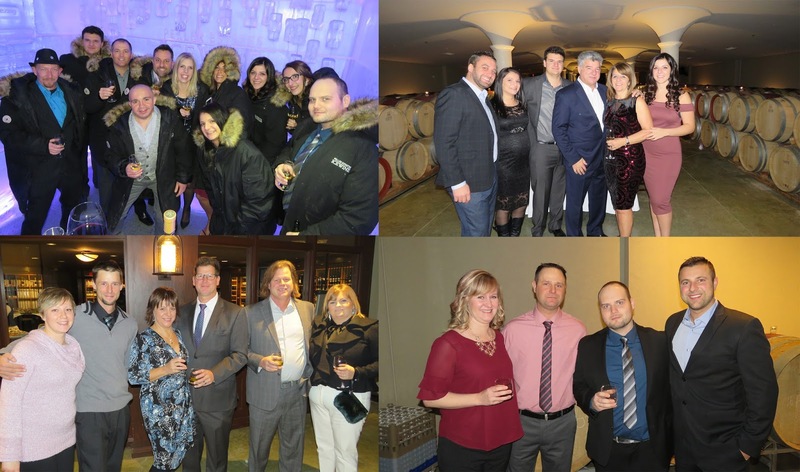 This year we had a lot to celebrate at our Christmas party! It was a record year for our company - we closed 64 homes and added more team members than ever before! That's why we wanted to make our Christmas party extra special this year and Peller Estates helped us do that - the venue really set the tone for the night and the staff was amazing! Looking back on the year, our team had a lot to be proud of. We were CHBA & OHBA Finalists, NHBA's company of the Year, and we contributed to a number of organizations in our community: Big Brothers and Big Sisters, The Holmes Foundation, YWCA, Niagara Dog Rescue, Niagara Life Centre, Kristen French Child Advocacy Centre of Niagara and Community Care to name a few. For our #12DaysOfGiving we wanted to go bigger as well, we looked at giving back outside of our community to those in need. With World Vision we made a donation on behalf of each employee - we gave the gift of food, a source of income, health and education to families in need. We are so proud of our team and what they have been able to achieve this year, we are so excited for what the future has in store for this amazing group of people! This year one of the members of our team, Ryan, suggested we look at giving back to Community Living St.Catharines - and what a great idea! As soon as I reached out to the organization, Mary was more than happy to tour me around their facility and show me all of the amazing programs that they run. My tour ran at the perfect time, I was able to see a sneak peak of their Christmas pageant finale! If you aren't familiar with Community Living St. Catharines (CLSC), let me take a moment to give you some history. CLSC was formed in 1953 by a handful of parents who were determined that their sons and daughters would get every opportunity to reach their full potential. With this in mind, they have been serving children, teens, and adults with intellectual disabilities for over 63 years. With a population base of approximately 165,000; they assist some 800 individuals and their families residing in St. Catharines, Thorold, and Niagara-on-the-Lake. Their services include a participant driven adult day program that promotes individual growth through meaningful community and center based recreation and leisure activities. This program currently creates opportunities for about 285 people throughout the week with plans for adding evening and weekend programming for newcomers. They also provide 24 hour/7 days per week staffing support to assist 65 residents living in group homes throughout Niagara. Individualized support plans offer life skill development and learning opportunities that promote healthy lifestyles. The staff are also made available to provide assistance to another 62 individuals either living with host families or renting their own apartments. Further, nearly 400 children and their families are aligned with members of their staff team providing emotional support and practical assistance navigating the service system. As part of our #12DaysOfGiving we attended Community Living St.Catharines' Christmas pageant and presented them with a new stereo system for the gym. The system is an integral and very fun part of their day programs. We were happy to help support this amazing organization and help them make the community truly accessible for all members of our community! 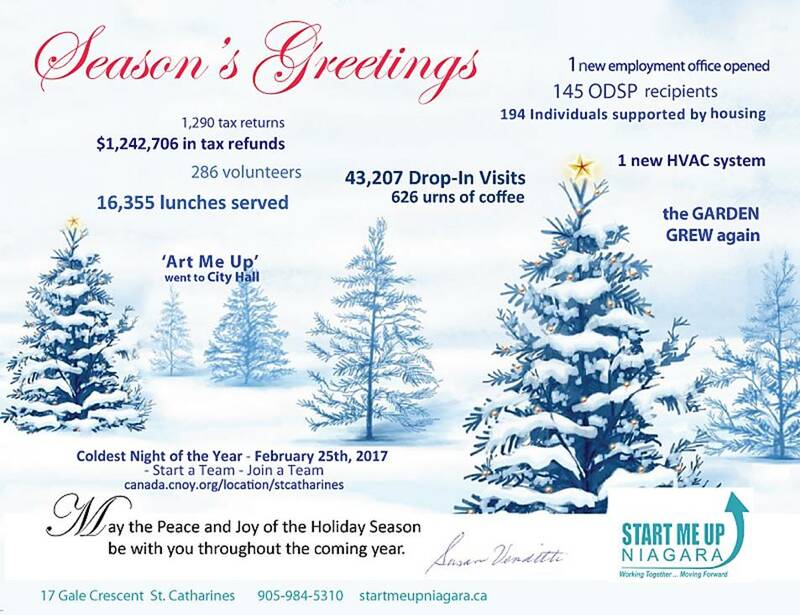 Start Me Up Niagara's Out of the Cold program began again in November - and this year they are seeing record numbers. We have been very lucky with the weather thus far, but if the last few days are anything of what's to come, we are in for a cold winter! In an article in Niagara This Week, Director Susan Venditti has said there is an increase in attendance in not only the dinner program, but also overnight stays. “We’ve had nights where there have been as many as 46 people staying over,” she said, adding that’s well over the usual “busy night” of past years that would see a high of 25 to 30 people. This year we continued the tradition of serving at Out of the Cold. Seeing the number of families and individuals that don't have a warm place to stay or food to eat is really heartbreaking, especially around this time of year. It is hard to describe that feeling of realization and appreciation for what you have after that experience. It really brings a new meaning to the holiday season! We were very happy to help the Out of the Cold program and serve a special meal to those in need. The tree is starting to fill up here at the office! This year we sponsored a family of 4 with Community Care, we were so happy to give back to such a staple in the Niagara community! Community Care has been meeting the needs of the less advantaged since 1919. Their mission is to compassionately provide vital service and assistance to individuals and families that meet their basic needs and help bridge their journey to self-sufficiency. It's time to get in the Christmas spirit, and what better way than to give back to our community. This year we started by reaching out to our team to see which organizations they would like to partner with, and we have come up with a great line-up! Day 1 of giving began on Saturday when we had our Construction team out to the Niagara Ice Dogs game. Along with our team we welcomed a big group from Big Brothers Big Sisters! With our team being so busy, it was a nice outing for them to relax and enjoy some team bonding. The mentors and kids from BBBS loved the game and they had the chance to see an exciting one that ended in OT! We would like to thank not only the staff at BBBS, but also the volunteers that dedicate time to mentoring children in our community!